I can SOOO relate. Chocolate lab ears are also wonderfully soft, and I find myself rubbing my Sam's ears when we snuggle up in bed every night just like my youngest used to do with his "woobie" blanket. And I'm a nurse, so when I go to work every morning I make sure and go past the nursery windows and look at the babies. No matter how much I tap and smile and motion they won't let me come in and hold one, though. Those nursery nurses are just baby hogs! You mean babies don't scream 24 hours a day? How come no one told mine that? I have to comment on this one, we owned a beagle for 12 and a half years and yes you are right, there is nothing to compare with the silky softness of a beagles ear, 'silk purse' my husband calls them. Labradors, are soooo lovely (and better behaved usually) my mum has a black one, but I'm afraid the beagle wins hands down on the silky ear contest!. I used to have a basset hound when I was a kid - his ears were lovely. I'm not with you on the baby thing though - unless it's my baby. Other people's babies should be held by other people, it's my rule! Your beagle's ears remind me of one of our rabbits' ears. He was a french lop bunny and his ears were so long and soft. It was very comforting to stroke his ears, like a warm fuzzy blanket!! On the other hand, I have no desire to hold a baby once a day, screaming or not!!! Maybe in about 20 years or so but definitely not now! Hahaha! I don't think a day goes by that something I say doesn't come out wrong. I agree about the holding babies bit. If there were any readily available for me, I'd probably keep them longer than three minutes! 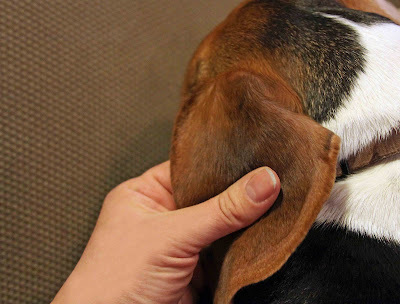 Here, Here to holding babies with their wonderful fragrance (minus the dirty diaper) and to velvety soft beagle ears - we had one when I was a child and I still remember how smooth those ears were. Babies every day! Yes, such a great idea. I believe you are onto something. I tend to stand and rock invisible babies anyway, although my girls are now 11 and 12. Weird, huh?